Cheese cake can be called a dietary product. Even though it contains a small amount of sugar, but as a basis cream used cream cheese instead of fatty oil, so the calorie content of the finished dessert is much lower than his "brothers". 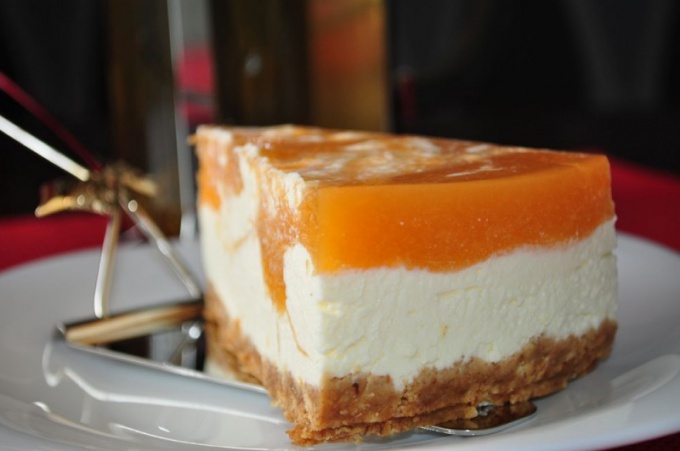 Cheese cake – delicious and delicate treat. - 1 tsp of baking powder. - 2 tbsp vegetable oil. Preheat oven to 180oC. The bottom of a split form grease with oil. Whisk eggs with sugar and grated orange zest. Flour mixed with starch and baking powder, sift. Mix with eggs. Pour into form and bake for 30 minutes. Let the future of the cheese cake to cool, remove from the mold. Biscuit cut horizontally. The bottom cake, place on a dish and set around the rim of the form. For the cream soak gelatin to swell. Orange juice mix with sugar and heat on the fire. Dissolve swollen gelatin in it. Allow it to cool. When the mixture starts to thicken, add cottage cheese. Whip the cream and combine with cream. Half of the cream put on the cake. Cover with second layer and press down. Put the remaining cream and flatten. For jewelry, soak the remaining gelatine. The bottom spread on the cake, pre-brushing them with vegetable oil. Heat wine and dissolve gelatin in it. Pour the mass into molds for the cake and put cheese dessert in the fridge for 8 hours. Take out the cake and remove the moulds and the rail. Whip the cream with sugar and fixative cream. Cover with cream edge of the cake and the remaining cream using a pastry bag spread on the surface of cheese cake. Edge optional sprinkle with nuts.